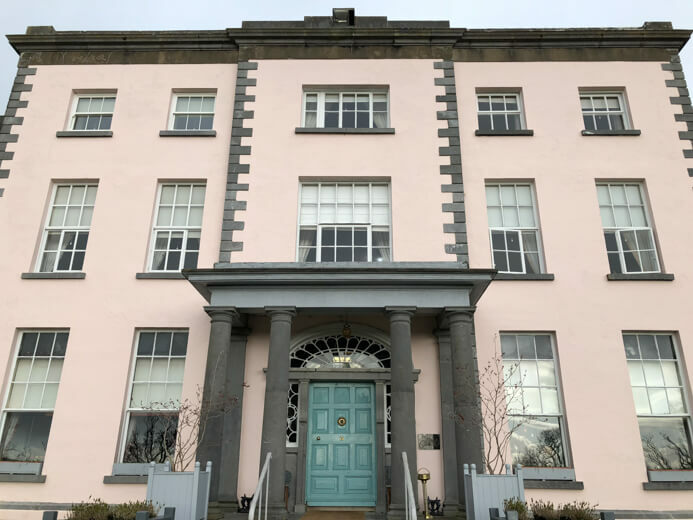 This Longueville House Cork review is part of a series of posts from my Munster Vales travel guide. 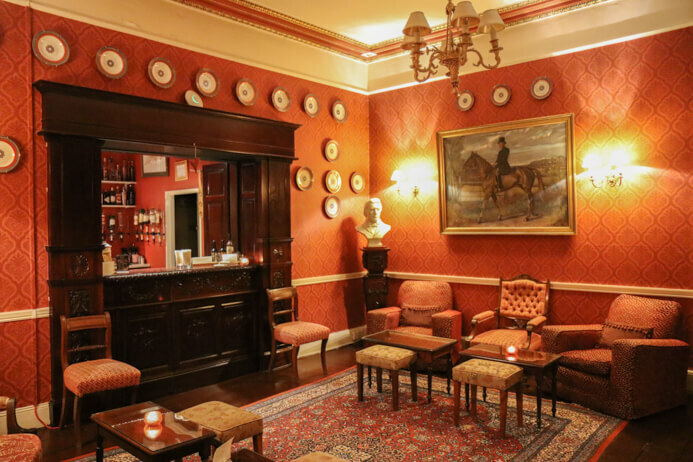 It’s also one of three posts on Longueville House, the other two are Longueville House Restaurant review and Longueville House Beverages hot apple cider recipe. Disclaimer: this was a complimentary stay as part of my tour around Munster Vales. I was not required or asked to write a review, however, I decided to do so as I had such a positive stay. Driving the tree-lined road that leads to Longueville House didn’t give much away in terms of what awaits you at the end. It was a surprise to see an elegant, pink Georgian mansion appear at the top of the driveway. It add a much-needed pop of colour to the grey-toned evening. Pushing open the heavy, green front door revealed a hallway bathed in soft light that instantly warmed me up. 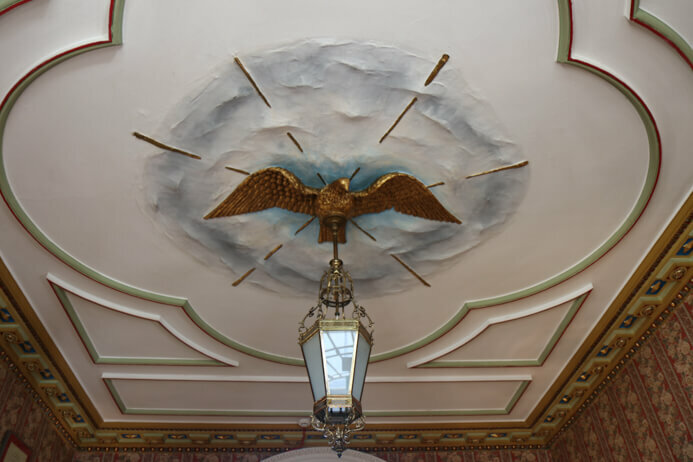 The hallway has the most wonderful original features like a glass archway and ornate, colourful ceiling. Gilt-framed portraits and mirrors adorn the patterned walls. There is also a gallery of framed awards and certificates celebrating this listed heritage property. My eyes lit up as I scanned the antique cabinets bulging with jars of jams, chutney and honey and bottles of apple cider and apple brandy all baring the Longueville name. Furthermore, I was even happier to see that they were all for sale, should I want a keepsake of my stay here. Aisling O’Callaghan greeted us at the door. 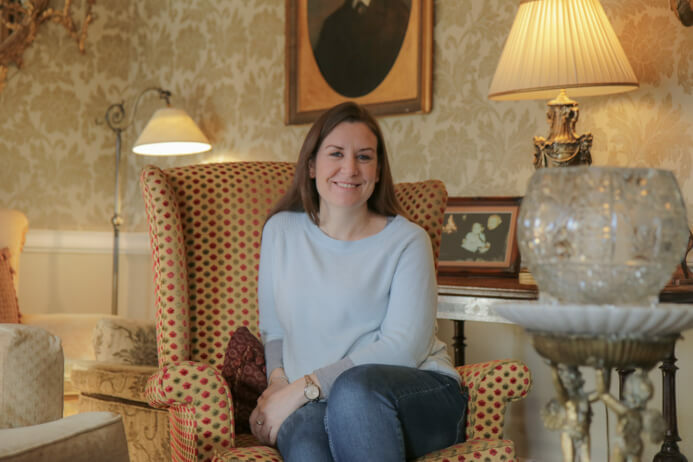 Aisling, along with her husband William O’Callaghan, owns and runs Longueville House. She is a convivial host and one of these women to whom you immediately warm. There are 14 bedrooms in Longueville House and six suites. There’s even lovely cosy single rooms which are perfect for solo travellers. We stayed in the ‘Vineyard’ Suite, which is a bit special, to say the least. Firstly, it’s huge, with a king size bed and a separate seating area with a couch, armchairs and coffee table. To the side of that is a big dark-wood wardrobe with plenty of storage as well as tea and coffee-making facilities. There’s a table and two chairs in the other corner, perfect for getting a bit of work done. 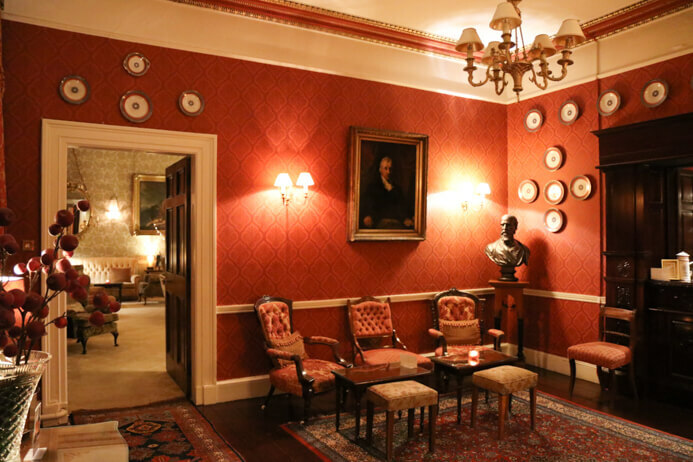 Hopefully, when you visit Longueville House you won’t have to work but if you do, the Wi-Fi is fast and free. 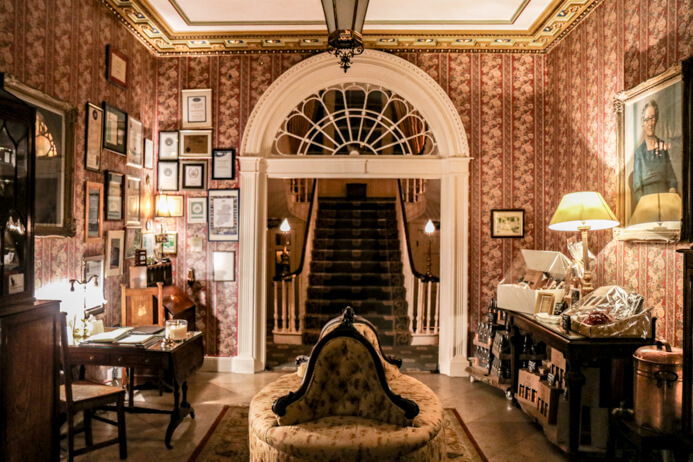 The decor of the room is that of a traditional country house with period-appropriate furnishings. The floral wallpaper, deep carpet, window shutters and soft lighting lend a warm, relaxing, timeless feel. Everything is plush and there are heavy curtains decorating the sash windows which do a fantastic job of blocking out all the light. Here is the room tour. The linens on the canopy bed are soft against the skin and the bed itself is comfortable. I had a very restful night’s sleep. This is also helped by there being no TV or other distracting items in the bedroom. The room was very dark and quiet at night. Just how I like it. The bedroom windows overlook the vine pergola to the West and the Palladian courtyard and garden maze at the rear of the house. I squealed with delight as I saw four dogs playing chasing around the spiralling maze. I later learn that the dogs will go with you on walks. Best hotel amenity ever! 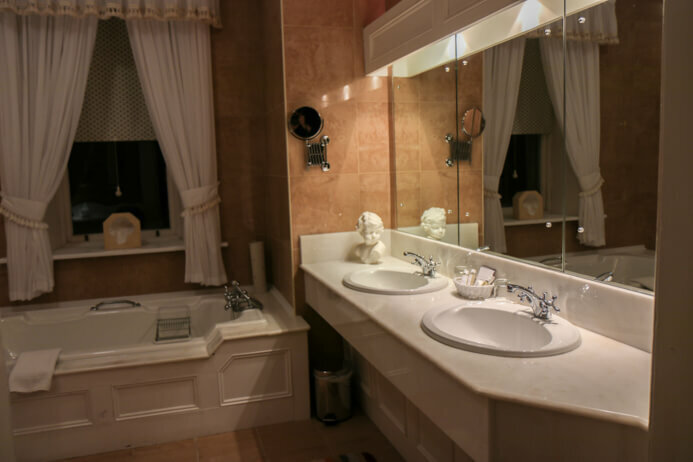 The room also has a huge white marble bathroom with a deep tub begging to be filled and enjoyed. There is also a separate shower and both are big enough for two (nudge-nudge, wink-wink). There are waffle bathrobes and fluffy towels and the water pressure is excellent. After a while, we managed to drag ourselves away from our cosy room to go back downstairs for dinner. I couldn’t wait to sample some of the food and cooking for which Longueville House is renowned. We made our way through the vibrant red residence bar and into the lounge to enjoy some cocktails and pre-dinner canapés. We curled up on the sofa by the blazing fire and finally relaxed after our long day. The lounge is an impressive room filled with elegant armchairs, plush sofas, ornate mirrors, chandeliers, candelabras, and heavy drapes. There are enough areas so that you always feel like you have a little sanctuary to yourself even if the room is full. The prime spot, however, is on one of the high-backed chairs in front of the huge fireplace. The room made me feel like I was in Pride and Prejudice and Mr Darcy was going to burst through the door any minute and dry off his breeches in front of the fire. Oh, my! We were escorted to the Library Restaurant for dinner. The dining area is elegant but relaxed with a roaring fire and bookcases overflowing with old tomes. The dinner was superb with a thoughtful menu, creative vegetarian options and a strong field-to-fork ethos. 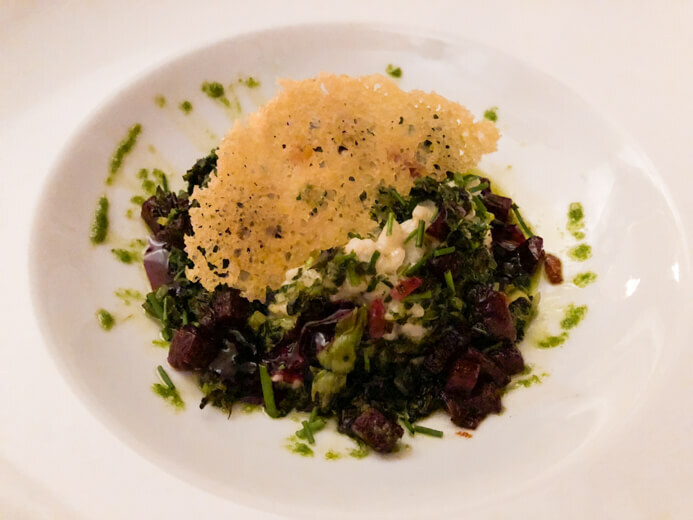 For an in-depth description of the meal please read my Longueville House Restaurant review. Walking from room to room, each space impressed with its tasteful, period-correct decor, lighting and relaxing ambience. Even with the high ceilings, the rooms all feel cosy and intimate. Here is a video tour of the restaurant, hallway, bar and lounge. In the morning, we had breakfast in the famed President’s Restaurant. The President’s Restaurant has beautiful wooden floors and fills with light as the sun streams through the long windows. The sun’s rays dance on the gold and brass fixtures creating a fabulously warm glow. It is the perfect setting for a long, leisurely, multi-course breakfast. 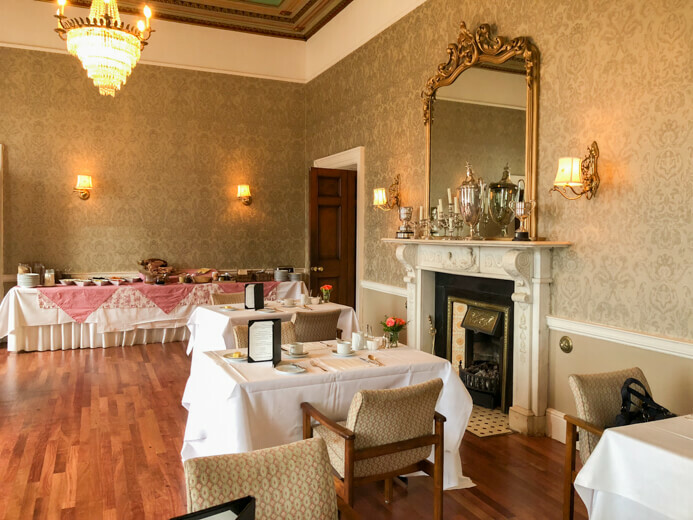 Just last month, Georgina Campbell Irish Breakfast Awards 2018, in association with Fáilte Ireland announced Longueville House as the ‘Best Breakfast in an Irish Country House’. 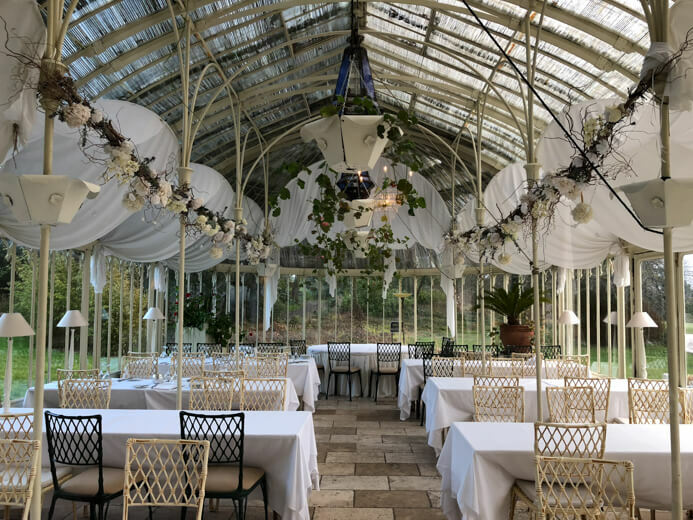 Click here to read my detailed review of breakfast in Longueville House and watch my video of the cold buffet options. 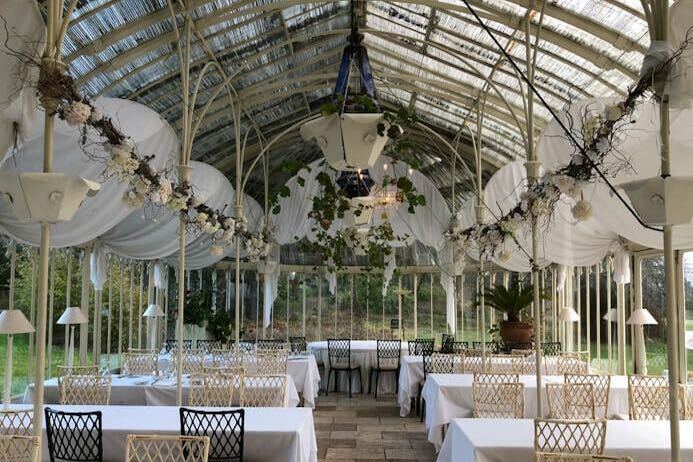 From the breakfast room, you can also admire the magnificent curved-ironwork of the Victorian conservatory which was added to the house in 1866 by Richard Turner, the greatest ironmaster and designer of glasshouses of the Victorian era. There is only one other Turner conservatory in Ireland and that is in the Botanical Gardens in Dublin. As far as I know, in the summer months, you can actually dine in the conservatory. It is a spectacular space. It would make a stunning wedding venue. After breakfast, Rubert Atkinson, the Sales and Marketing Manager of Longueville House Beverages took us on a tour of the estate. He is a wealth of knowledge and told us all about the fascinating and long history of the estate and the O’Callaghan family. He also showed us the walled-gardens with their extensive greenhouses and poly tunnels. Longueville House must have one of the best herb and vegetable gardens in the country. We also saw the extensive orchards where the apples are grown to make the award-winning Longueville House cider and apple brandy. Rubert is particularly proud of the orchard and he really knows his stuff when it comes to making cider and the Irish cider industry. As these drinks are made on site, you can arrange tours and tastings. Click here to read my blog post on Longueville House Beverages and the Longueville House Beverages Hot Apple Cider recipe. Apart from the distillery tour, you can make the most of the grounds and enjoy a variety of outdoor country pursuits. There is 500 acres of secluded woodland surrounding Longueville House with breath-taking views of the Blackwater Valley. You can try your hand at wild salmon and brown trout fishing on the River Blackwater, falconry and clay and game shooting. There are also seasonal events like Autumn mushroom hunting, and a guided May Dawn Chorus ornithology walk, how wonderful does that sound? This is the view of the vine pergola. As we discovered, Longueville House really is a destination in its own right. You don’t need to, and you probably won’t want to, go anywhere else. However, if you do want to tour around, Longueville House is an ideal base for exploring the South West of Ireland. It is just 40 minutes from Cork City, less than 10 minutes from Mallow and 15 minutes from Doneraile and around an hour from both Killarney and Cahir. Longueville House really does provide sanctuary and a slice of idyllic country living. Life revolves around relaxation and fine dining and leisurely pursuits. You are welcomed with open arms and made to feel right at home (if your home is a sprawling Georgian mansion that is). Yet, despite the grandeur of Longueville House, it feels more like an enchanting country inn run by long-time friends, who just happen to be award-winning chefs and distillers. Thanks to Tríona O’Mahony of Munster Vales and Aisling and William O’Callaghan for organising our stay in Longueville House. 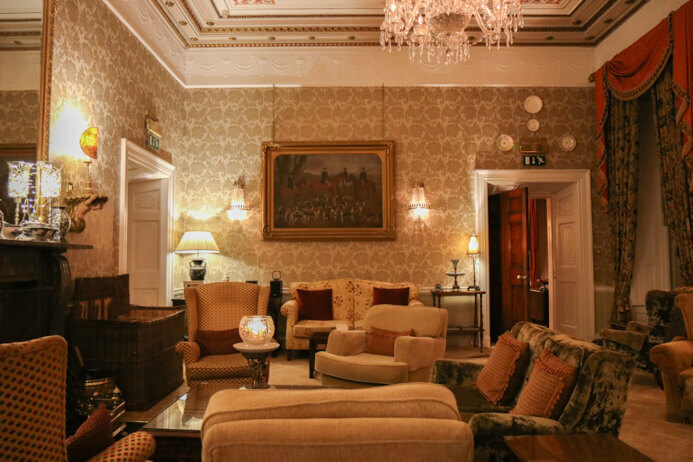 Do you have a Longueville House Cork review? Let me know and I’ll link to it from this blog. 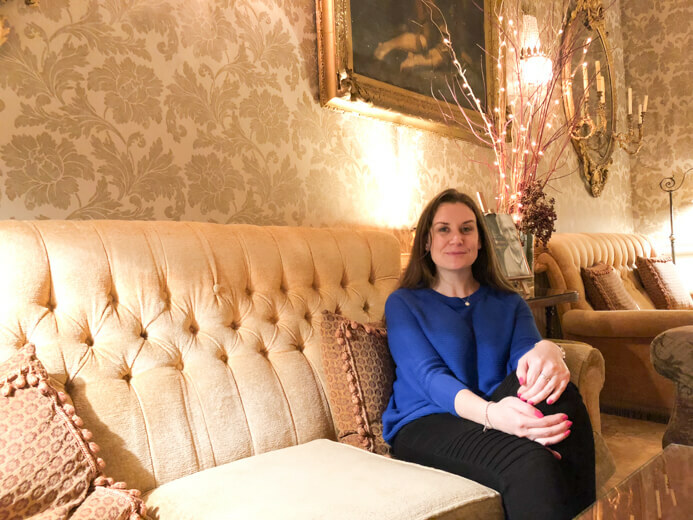 Have you been to Longueville House and did you love your stay as much as I did? Let me know in the comments below. I love hearing from you. 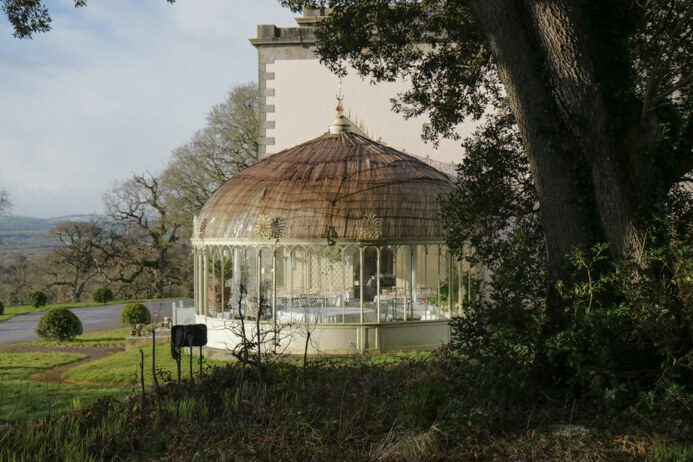 If you liked this Longueville House Cork review you might also like my review of the Finn Lough Bubble Domes in Northern Ireland. 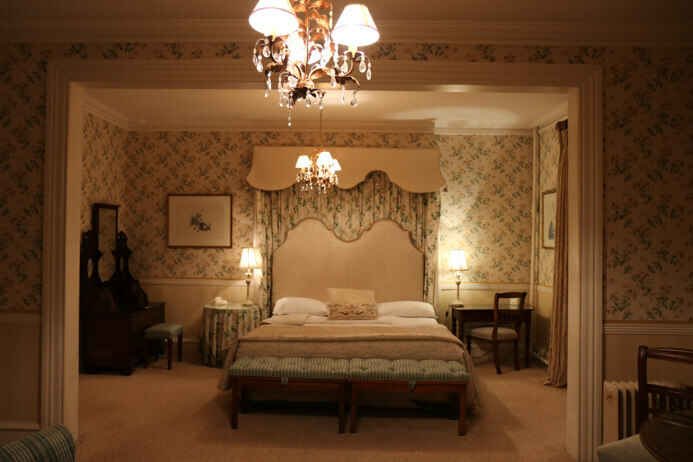 If you liked this Longueville House Cork review, please share with others.